Europe is littered with some amazing coastlines to explore and we’ve been lucky to see plenty during our European Roadtrip. But which ones are Europe’s best coastlines for kids to learn? 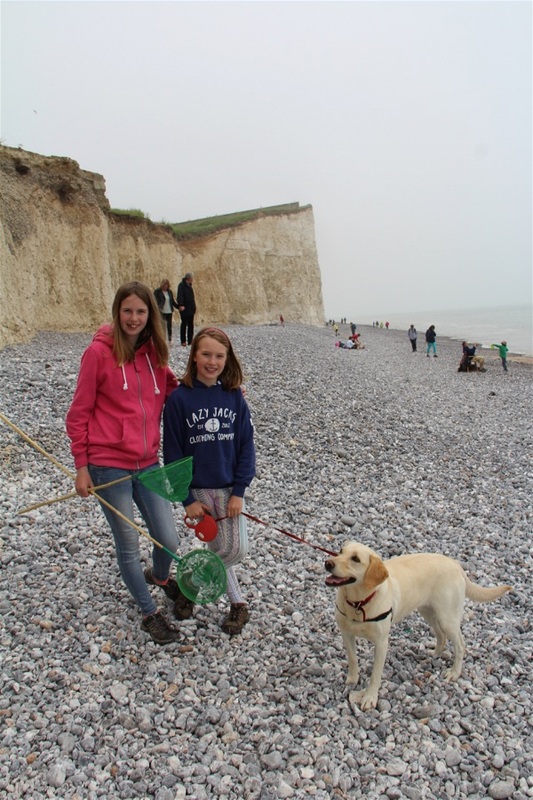 Why not read on and hear how one of East Sussex’s gems compares at Beachy Head. Beaches are great places for kids like ours to fill up on knowledge. Each beach is different, no one is the same. Bustling, lively places where you can discover new sights and smells around every corner! Although every coastline is unique, almost all are full of hidden spots to explore. So whilst some people will go searching for a vibrant city break. Our kids enjoy the hustle and bustle of rockpooling, dog walks along the beach or any chance to get in the water. 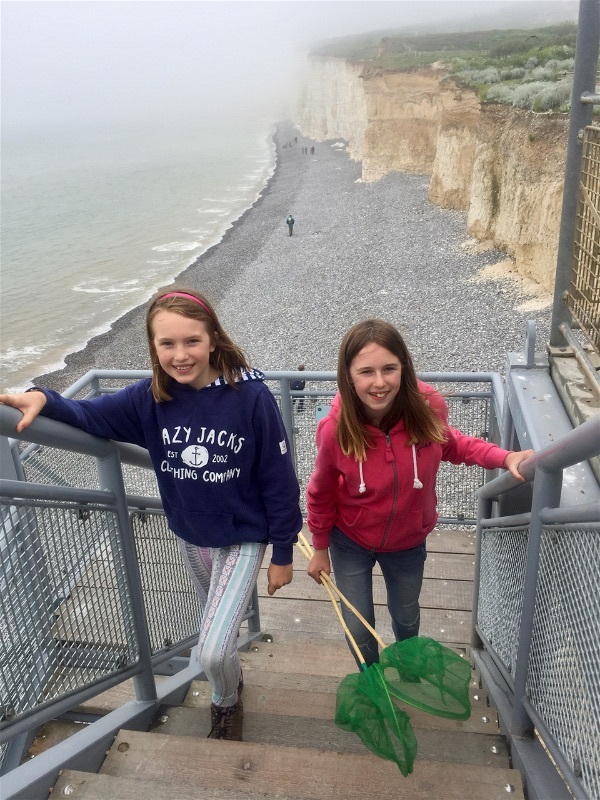 So add in the chance to grab a geology lesson at Beachy Head in East Sussex… and you’ve got the recipe for a great half term idea for active kids! Roadschooling our children across Europe’s major natural, cultural and historical highlights has allowed us to seek out new travel/education or adventure opportunities across Europe. Hence the phrase ‘Edventures‘! Now, everyday brings a new memorable outdoor classroom / playground / family adventure for us to discover together as a family. Especially if it is over 10,000 years old in Beachy Head’s case!!! One created at the end of the last Ice Age when the English Channel was created! It’s bright white, chalky cliff face offers plenty of hands-on opportunities to discuss the amazing geological formations and coastal processes that create these landforms.The coastline of East Sussex starts with the immense 7 miles of sandy beaches and dunes of Camber Sands (see here), but as the South Downs roll down to the channel, they end dramatically with the sheer white cliffs of Beachy Head and its Seven Sisters. Stroll the top of the 162m cliffs and you’ll see the Ilse of Wight and Dungerness to the east. A little like our ‘Seaside Foraging Lesson in Pembrokeshire’ (see here), there’s plenty you can find to explore and learn on a British Coastline…. and as Beachy Head is the UK’s highest chalk sea cliff feature, there seemed no place better to learn more about its geology and geography. Situated at the western end of Eastbourne seafront in the South Downs National Park, it’s immediately east of the Seven Sisters. But for those visiting in a motorhome, don’t despair as there is easy motorhome parking at Birling Gap which allows immediate access down the cliff via easily accessed stairwells. East Sussex’s coast has it all for kids. There’s historical sites everywhere, water sports in the calmer waters nearer Rye Adriatic, or numerous cliffside walks to explore. Or plenty of interesting towns like any of the Cinque Ports or our favourite Lewes with their chic streets to enjoy getting out of the hot summer sun. But for us, the biggest surprise was that Britain’s biggest fishing fleet leaves the nearby Hasting’s harbours. So interesting and a great source of local, tasty fish’n’chips to fill aching tummies! 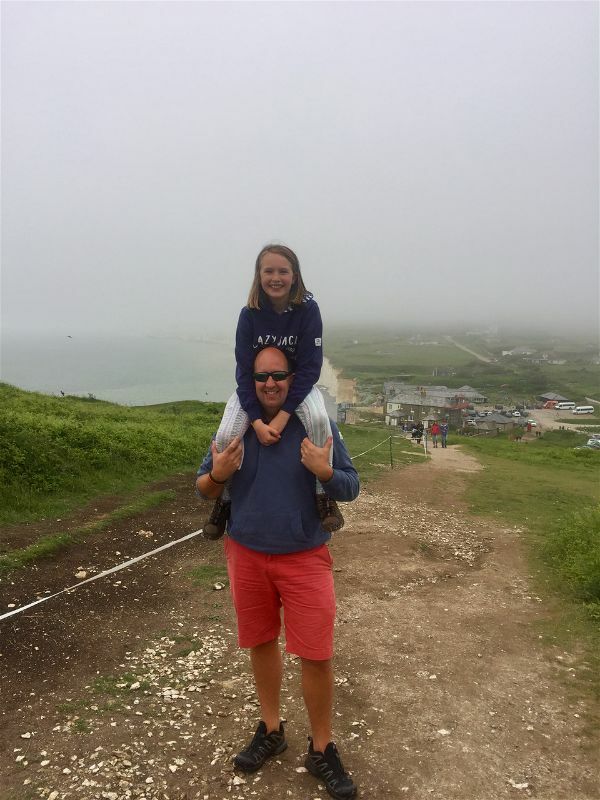 So why head for the ‘Beau Chef’ (the Norman’s version) or Beachy Head… well, put simply, we reckon you’ll be met with smiles from ear to ear. It’s just a great place for kids to explore, learn and most importantly have fun!! With over 11,000 miles of compelling coastline on offer…. The UK can boast one of the most spectacular and ever changing coastlines from across Europe. From vertigo inducing cliff to secret coves only reachable by boat…. it has sandy dunes, sand bars, spits and stacks and arches that will make any geographer salivate! It’s just a series of give and take with the seas that make erosion and deposition come alive from the pages of any geography textbook… It just needs you to get outdoors and enjoy it too!! Many of our happiest memories are made at the coast, and it’s no real suprise. Whether you want a bucket and spade holiday, a family walk along a coastal path or a morning’s sailing trip…. there’s oodles of potential in this spectacular part of East Sussex. Quieter than other more known coastlines (think Pembrokeshire, Cornwall or North Norfolk)…. it’s just so easy to reach and explore! The perfect way to enjoy a half term with the kids! PreviousTop 5 Family Friendly Coastlines we’ve discovered across Europe!